On board our balloons, BALLONS du LEMAN offers you a unique balcony from which you will see the Alps and the Geneva Lake region from a different angle! Over 2500m high or from the top of the trees, you will feel an exhilarating impression of freedom! The schedule of all our flights, whether morning or evening, in the plateau or in the mountains is available here. You can book the date of your flight online by filling in the fields below with your name, mobile phone, e-mail and your type of flight, located on your ticket. We will confirm that the chosen date is available. I confirm that I already have a ticket No tickets yet? Once you have chosen your flight date, you will receive a confirmation of your flight reservation via email. We will send you a text to the number you have given during your reservation to confirm whether the flight is taking place or not depending on the weather. In case of flight, we will give you the exact address and time of our meeting. The day before your flight you will receive a text message. You will receive a text message at the beginning of the afternoon. In case of no flight, we will invite you to plan your flight again. Call the day before, between 6pm and 7pm to confirm the location and time of the appointment. Call the day of your flight, between 1pm and 2pm, to confirm the place and time of the appointment. Welcome at the meeting point chosen by your pilot depending on the flight region. We can also pick up passengers from a CFF train station Departure in our vehicles to the take-off site. Presentation of the team and safety briefing. We prepare the hot air balloon together (if you wish). After over an hour in the air, we land smoothly and deflate the balloon. After landing, we enjoy a toast and a drink with a personalised diploma and a unique souvenir of your ascent. In our shuttle, we then drive you back to the place where we welcomed you. It is very important to be punctual on the day of the appointment. Indeed, Ballooning depends on the weather: the best conditions are early in the morning, at dawn or late evening, two hours before sunset. So, in order to make the most of these time windows, we thank you for your punctuality. In general, we set appointments to our passengers 1 hour and 15 minutes before take-off for the evening flights and 45 minutes before take-off for morning flights. Ballooning is largely dependent on weather conditions. We fly only when conditions are good: calm winds, no precipitation and no atmospheric instability. The flights are early in the morning or late in the day, shortly before sunset. It is at these times that we have the optimal conditions for this activity. In case of bad weather, your pilot will cancel the flight. You can plan the date of your flight again according to your availability. Our qualified pilots and crew share their talent and experience with you! They make every effort to make sure that our passengers have a pleasant and memorable time with us. We provide continuous training for our pilots. Our balloons meet the highest standards in terms of safety and control. During our flights, we can cross the Swiss border. You will need to have a valid ID card or passport for the Schengen area with you. For your comfort, we recommend to wear clothes similar to those you would wear for a hike. Flat shoes are essential. We also invite you to wear pants and a top with long sleeves. It is not necessarily much colder once in the air: the temperature drops usually by 2°C per 1000 feet (+/- 300m). Nevertheless, an extra warm sweater may be useful, especially for morning flights or after landing for evening flights. Do not hesitate to pack a sweater or jacket that you can remove or put on according to the conditions of the moment. We invite you to wear long clothes to avoid being bitten by thirsty mosquitoes and annoyed by insects. We recommend closed shoes and slightly high similar to hiking boots. If you are sensitive to the heat, do not forget to bring a hat. Avoid heels and/or open shoes as they will not protect your ankles and feet when landing on steep or wet terrain. It is important to wear comfortable clothes that will allow you to get in and out of the basket without difficulties. In order to make the most of your flight, you must be able to stand up for at least an hour. If this is not the case, contact us, we can offer you a seat for the cruise of your flight. 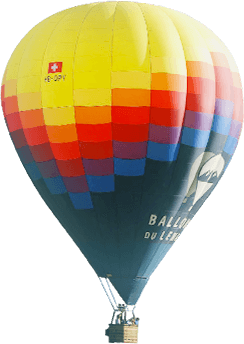 BALLONS du LEMAN has a basket designed to accommodate passengers with reduced mobility. It allows to go in and out through a suitable door. This basket also has a seat adjustable in height to make the most of the view. In case you have a doubt, do not hesitate to consult your doctor for advice or authorisation of a health expert. What weather conditions are needed? Balloon flights require light wind conditions, good visibility, stable air and no precipitation! All year round, seven days a week! The flights are early in the morning or late in the day, shortly before sunset. It is at these times that we have the optimal conditions for this activity. Check here flight times according to the season. From April to November, our flights operate in the Geneva Lake region (Geneva, Lausanne, Rolle or Yverdon-Les-Bains). From December to March we take off from Château d’Oex and Gstaad area. The exact location of the flight is chosen based on weather conditions and regulations. Feel free to tell us about your favorite flying region so that we can, as far as possible, satisfy you at best. Visit our map for more details. In general, the flight lasts an average of one hour. However, it takes three to four hours for the whole adventure. The Adventure flight offers two hours of flight and takes six hours of your time. It all depends on the direction and speed of the winds. The balloon is the only aircraft to navigate according to the wind. The average distance traveled during a flight varies between 12 and 18 kilometers. Nothing in particular. However, we recommend natural fibers for clothes and walking shoes. In general, an outfit similar to the one you would use for hiking. Anyone wishing to fly in a hot air balloon must be able to stand up for the duration of the flight. Unfortunately, we cannot accept pregnant women, people with heart problems or anyone who has had a recent surgery. In case you have a doubt, consult your doctor. People under the influence of alcohol or drugs will not be able to board. Absolutely if you wish to do so! Your pilot will encourage you to help setting everything up and preparing the hot air balloon! Our team will be there to brief you on what needs to be done! Will the weather be cold? Not necessarily, the temperatures at normal altitudes aren’t very different from the ones at ground level. What if I suffer from vertigo? Very few people who normally suffer from vertigo have this kind of issue when they are flying in a hot air balloon. Vertigo normally happens when there is a connection between the ground and where you are (the Eiffel Tower, a ladder, a chair, etc.). When you fly, you aren’t connected to the ground, therefore there is very little chance you would suffer from vertigo. Sometimes we fly just skimming the trees, sometimes at more than 6000 feet. But usually, the hot air balloon stays between 500 and 4000 feet. Any age and height requirements? There is no minimum age to fly in a hot air balloon. Our passengers must be at least 1m20 (4 feet) tall. Children under the age of 18 must be accompanied by an adult. What about our friends who wants to tag along without flying? They are welcome to participate to the preparation of the balloon and can follow our vehicle with their own car to the landing spot. We will communicate the meeting point address and time by text message on your mobile phone either on the day of the flight, if you’re flying in the evening, or the day before if it is a morning flight. If you don’t receive our text, we ask you to give us a call between 1.30pm and 2.30pm CET if your flight is in the evening or the day before between 6 and 7pm CET if your flight is in the morning. If the forecast isn’t good enough to fly, we will reschedule the flight with you. Once you’ve made the payment which activate your boarding ticket, we invite yo​u to check our availability on the calendar. You can then fill in the online request form to schedule your flight. You will then receive an email confirmation with all the details. How to buy a flight? You can either do it online by clicking on the buy a ticket page, or you can simply call our office. The flights can be paid by credit card, cash or bank transfer. If you chose to pay by bank transfer, we will send you our bank details by email or post. Will there be champagne to celebrate? Yes, all our flights are celebrated with champagne, juices and other soft drinks after the flight. We also serve nibbles to go with the drinks. Can I cancel my flight if the weather is not sunny? Unfortunately, that is not possible. It is up to the pilot to decide if the weather conditions are good to operate the flight, which means when the air is stable, there is no rain and there is a light wind. If the weather conditions are too bad to do the flight, we will reschedule it for another date. It happens on very rare occasions that we have to cancel the flight at the last moment, sometimes even just before taking off. Security comes first, and we don’t compromise on that. How many people can participate to the flight? Our balloons have different size and capacity but always have a human scale. Our smallest balloons welcome from 2 to 4 passengers, the medium size ones can fit up to 8 passengers and our largest balloons have a capacity of 12 to 14 people. What happens if I need to change the date of my flight or cancel it? That is not a problem. As long as you contact us at least 48 hours before the date of the flight. The ticket will be considered as used if the flight was cancelled after this deadline or in case of no-show. Statistics prove it: hot air ballooning is one of the safest air sports there is. Security is our first priority and we will not do any compromise on it. My flight ticket has expired. How to extend it? No worries. You can buy a validity extension of 12 months for your ticket. In that case, don’t hesitate to drop us an email or give us a call.